On October 7, 2018, more than 147 million people were eligible to vote for executive and legislative branches at the state and federal levels, casting ballots for president, 27 governors, 54 senators (two-thirds of the Senate), 513 federal deputies, and 1,059 state deputies. In an October 28 runoff, far-right candidate Jair Bolsonaro won 55 percent of the vote against 45 percent for the left's Fernando Haddad. In a sign of voter dissatisfaction, the runoff involved the largest abstention rate in 20 years. In total, 42 million people didn't choose any of the candidates and over 31 million people decided not to show up at the polls at all. Pitching himself as the answer to violence and corruption, Bolsonaro's victory has drawn human rights concerns due to his use of bigoted language and nostalgia for the period of military rule. Aside from marking a hard shift to the right, his win also saw a departure from what's been traditional in Brazilian politics since the start of the country's democratic era: he did not win through coalitions with larger parties or television time, but with the help of social media and fake news. Bolsonaro will be inaugurated on January 1, 2019. 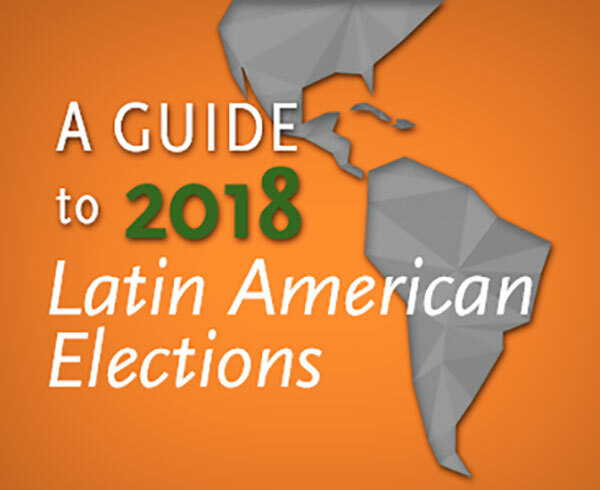 >> Find out about other elections in our main 2018 Election Guide. AS/COA Online offers regular updates on the course charted by the new administration in Latin America’s largest country. Is Brazil’s environment in danger under Jair Bolsonaro? Aos Fatos’ Tai Nalon explains how the country’s 2018 elections proved a new, complex relationship between voters, news, and government. Experts discussed the next steps for President-elect Jair Bolsonaro and how his first measures can affect the country's economy. AS/COA’s Brian Winter and Roberto Simon explain in Foreign Affairs what makes Jair Bolsonaro’s foreign agenda similar to Donald Trump’s. Jair Bolsanaro and Fernando Haddad face each other in an October 28 runoff. Here's what the polls say. Ahead of the October 28 runoff, we look at the presidential candidates’ positions on issues ranging from Venezuela to trade. A comprehensive survey of what the former army captain’s government might look like, if he wins on Oct 28. We look at the history of presidential runoffs, break down the vote regionally, and map the gubernatorial races still to be decided in October 28 runoffs. Meet the New Brazil. A Lot Like the Old Brazil. History helps explain Jair Bolsonaro’s surge to the cusp of the presidency, writes AQ’s editor-in-chief. Social media is driving the conversation—and a wedge between genders—in this year's presidential vote. Brazil's far-right candidate Jair Bolsonaro was less than 5 points away from winning the first round. He'll face Fernando Haddad, the left's stand-in for ex-President Luiz Inácio Lula da Silva, on October 28. Brian Winter, da AS/COA, escreve na Folha de São Paulo sobre os temas que interessam aos eleitores brasileiros e que podem persuadi-los a não votar em Jair Bolsonaro. Listen: AS/COA Brazil experts Brian Winter and Roberto Simon cover the race and why leading candidates Jair Bolsonaro and Fernando Haddad represent competing visions of a “better” past. Ahead of the October 7 first round, meet the contenders in Brazil’s unpredictable race. On October 7, Brazilians will elect 27 governors and 567 members of Congress. We look at those competitions and top voter issues. Economist Monica de Bolle discusses the prospects of a fiscal turnaround under Brazil's next president on this episode of "Deep South." Panelists discussed top issues ahead of the country's October elections, as well as each presidential candidate's economic platform. Given the tempestuous nature of Brazilian politics in recent years, here are dates to help bring clarity as we approach the October 7 elections. It’s a Lula Election in Brazil. Again. The imprisoned former president will be center stage in the Oct. 7 election – even if he’s not a candidate. A leading candidate for president sounds off on his rivals – and friends. With four months to go until election day, a Datafolha poll shows a jailed ex-president ahead. What happens if he can’t run remains in doubt. Candidatos bolsistas da RenovaBR falaram das dificuldades do sistema político atual e como se preparam para renovar a política brasileira. Geraldo Alckmin is the preferred candidate of Brazil’s establishment. In today’s environment, that may be a kiss of death. Given voter disillusionment with traditional politics, the country’s parties are rebranding to rebuild their influence. A year before general elections, we profile the parties. Listen: Prospectiva Consulting’s Ricardo Sennes explains how the country’s economy is moving forward and what a presidential candidate will need to do to win the 2018 election.